What’s up with Mr. Dapper? Mr. Dapper, yours truly, has been writing at some other places of late. Which is why it might seem this blog has been neglected. Mr. Dapper hasn’t been neglectful so much as spread-thin writing-wise. We’re due for some more Dundas Dining soon too. So stay tuned for that. Also, I’ve started doing micro-fiction on Mr. Dapper’s Tweets of Wisdom. On Monday’s I start a five-part piece of short fiction which concludes on Friday’s. You can see the results in the window to the right as well. I’m doing my music writing at Simply Read on the Simply Syndicated site. Right now I’m doing a project where I roll 2d10 (that’s two ten-sided dice commonly used in role-playing games for you non-nerds) to select a CD from my collection for review. I call it Bone Rolling Reviews. Total music nerdery. And just in time for Halloween, I’ve also posted an essay on zombies at The Hurdled Nerd, the companion blog for our Nerd Hurdles podcast. Mandi and I will be manning the Ampersand Publishing table at Canzine 2009. We’ll be selling Ampersand mini-books and handing out Nerd Hurdles stuff. If you’re in the Toronto area, drop by and say hello! We’ll probably be tired because it’s the day after Halloween. You’ll probably be tired too. I rounded the corner, pulling my jacket tighter around me in the grey cold of the frosty morning light and there, right there, was a swarm of pigeons. As I passed the writhing, almost cannibalistic, scrum I saw it wasn’t a pile of breadcrumbs they were fighting each other for the right to devour. It was a puddle of vomit. It was frozen and looked like it might have been a meal of french fries, probably from the nearby Wendy’s. Someone’s exciting night had become the pigeons’ exciting breakfast. There’s a few nice reviews (I haven’t been able to Google any not nice ones) of Moonwood’s CD/DVD Aubade posted around the internet these days. The first was from the Fatal Interview blog. The second was from the Geogia Straight‘s website. Now I should probably start sending these things out to various media before the new year creeps around the corner. Things move slowly at Ampersand Publishing and Productions. About a month ago, late in the afternoon, while we sat around drinking beer, L’s mother J gave us an impromptu psychological test. If you could answer the following question correctly, you were a sociopath. A woman goes to her grandmother’s funeral and meets a tall, dark, handsome stranger. They hit it off immediately, finishing each other’s sentences and laughing at each other’s jokes. It’s practically love at first sight. Due some circumstance she doesn’t learn his last name or exchange any contact information. A month later she’s arrested for killing her sister. Why? Mandi and L offered a few theories based on motives revolving around revenge and monetary gain. It took me a minute or two but the answer was clear. She had killed her sibling hoping the handsome stranger might come to her sister’s funeral as he had her grandmother’s. I felt silly it had taken me so long to get it. Mandi said, “Oh right. You’d told me before you felt a kinship with Dexter,” and tried not to look worried. At this point she decided we needed to drink a third pint. We went to dinner at a local steak house with another couple more friends of Mandi and L for a little of the Thunder Bay flavour. The brick-walled restaurant had amazingly delicious buns at the salad bar but was otherwise fairly ordinary. They did have Stella on tap though and so I had my fourth pint of the afternoon because one wouldn’t want to seem unsociable when out to dinner with people one hardly knows and may suspect one of being a sociopath. Dinner was progressing well. I was gnawing on my Pioneer Bones “for the Fred Flintstone type” (which really were just a pile of bones) in a beatific beer-induced haze when I became vaguely aware Mandi suddenly on the other side of the table and was cradling L’s mom’s head in her arms saying her name repeatedly. L was sitting across from me in frozen, wide-eyed panic saying words like, “She said she felt funny.” I looked to J whose eyes were open and unfocused above her slack, expressionless face. At first she appeared to be unconscious but then it was clear she was awake but vacant and non-responsive and disoriented. As if from a seat in a theatre watching a performance, I watched Mandi instruct L to take her mother’s hand and talk to her. The look of distilled anxiety in L’s eyes made her suddenly appear years younger; a child frightened by noises in the dark. “Why can’t I do anything?” she said. Unable to offer any answer to the pleading in her eyes, I turned my attention back to her mother’s dead, expressionless gaze. It was chilling and sobering to see a woman I hardly knew in the throes of what appeared to be a stroke, so I took another swig from my glass. The beer had lost its ability to intoxicate me though so I had to face the situation with an acute, irrational dread I’d be called upon to act in some way. This seemed unlikely since someone else had already managed to have our server call the paramedics and Mandi was describing over the phone the symptoms she was witnessing. I glanced across to our other dinner companions who looked completely stunned. Turning around I saw none of the other restaurant patrons seemed to have noticed anything as amiss at our table. It added a little more of a surreal flavour to the situation. Mandi asked J if she knew where she was. The answer was a very slight, unconvincing nod which concluded with the unfocused eyes drifting down towards the table. She asked her if she could stick her tongue out which was also greeted with a nod but a refusal to do so. I was impressed and proud with the way Mandi took control of the situation. Something far beyond my abilities. Then, almost as quickly as it had rolled in, the fog seemed to lift. Soon J was joking with the girls about looking forward to the hot paramedic who was bound to show up. It seemed like I didn’t even have time to take another sip of beer when the paramedics arrived. And indeed one of them actually was the stereotypical pin-up fireman calendar hottie. As he ran J through the paces, asking her about her symptoms, his older and much less attractive partner cracked jokes. Since the crisis seemed to have passed, I shrugged and tackled my Pioneer Bones with renewed vigour. “Look at this guy eating and making me hungry,” joked the older paramedic. I looked around and saw that everyone else at the table had clearly lost their appetite and had pushed their plates away. Was it bad form to continue eating? I had the sinking feeling it was inappropriate to be gnawing on ribs when a member of the party was being examined by paramedics. “Well, I already failed the psychological exam portion of evening,” I said, forcing a laugh which was not picked up by anyone else. The paramedic deflected attention from this awkwardness by trying to convince J to visit the hospital. She refused by promised to see the doctor at her work the following Monday. She had to compete in a boat race the next day. It struck us both as odd we’d been unconsciously avoiding Pascal’s Baguette and Bagels. Mandi thinks this might be due to, from the outside, it appears to have a lot less seating than there actually is. Myself, I was turned off by the font on the windows. Even if Pascal’s does know how to use an apostrophe to indicate the possessive tense. Perhaps it’s simply because the cheesy gold art deco font on the window is at odds with the awesome, rustic carved wooden signage above. 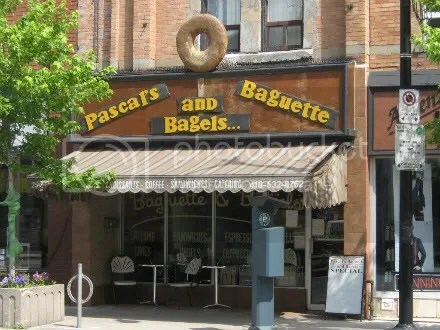 Though, now that I look at the photo, the sign actually reads, “Pascal’s and Bagels… Baguette.” Which doesn’t make a lot of sense. After some deliberation, we decided our hesitation was more to do with it being unclear, despite the name stating “baguette” and “bagels”, whether there’d be much in the way of “food” available. We’d sort of written it off as a breakfast place where you’d get a coffee and a croissant. But no. There’s quite a varied menu which includes hot sandwiches, quiche, a beefy (pardon the metaphor) looking vegetarian pizza plus the titular baguette sandwiches and bagels. Oh, and coffee and croissants too. The chocolate croissants were calling to me. As were some decadent looking chocolate tart thing-a-ma-jigs on the counter. We don’t know what they were but they looked like orgasms in caloric form. To experience the spectrum, I ordered a roast beef baguette and Mandi the peanut butter and banana bagel. Both the baguette and bagel appeared to be home-baked—if not at the establishment itself, then fresh from a bakery near-by. Mandi’s bagel was “possibly the best bagel I’ve ever eaten.” My baguette sandwich was light on the roast beef but generous with the cheese. Not an unpleasant reversal of common sandwich making custom. Though not “the best I’ve ever eaten” definitely worth a return. Especially since the menu is reasonably priced. The croissants are still calling to me. Even after I’ve just eaten a brownie. Our Americanos were good. A decent head of schiuma. Not as delightful as Madison’s Creperie, but as I have mentioned previously, such comparisons are unfair. There was one detractor. A high-pitched, incessant, mechanical whine bored into our skulls the entire visit. Next time we’ll sit at the outdoor tables. 4.5 baguettes out of 5 bagels. At Dundas West station a young black woman got on the train. She was wearing huge sunglasses which covered most of her face. No one paid much attention to her. Not until she was suddenly howling with grief. At first it was hard to tell if she was laughing or crying as she had her head buried in her lap pressing a cellphone to her ear. When she raised her head, it was clear that tears were shaking her body. The source of her grief seemed to be the cellphone conversation—the train is above ground on that stretch of the route—but if there was anyone on the other end, they were doing all the talking. As the woman bellowed her pain, people began to give her sideways glances. They seemed unsure it was a genuine display of emotion. It was the sort of grief one normally only sees in movies when an unhinged widow throws herself on the coffin. She appeared to be one step away from rending her garments or tearing out her hair. She rocked back and forth in her seat wailing and clenching her fingers. Her crying continued for several stops and I assume continued long after I got off at Runnymede. You are currently browsing the Mr. Dapper's Diary of Everyday Curiosities blog archives for October, 2009.